Mixer Sales asked Erich Stauffer to help them get better search engine rankings for their primary keywords, best mixers and mixer sales – and now Mixer Sales is ranking on the first page of Google for ‘mixer sales’! While Mixer Sales ranks #6 for the keyword ‘mixer sales’, they currently don’t rank in the top 100 for ‘best mixers’, which means we still have some work to do, but we believe in celebrating the small victories. We also helped them setup what we call a ‘sticky page’ which is a page that stays on top of WordPress blog post listings. This is named after ‘sticky posts’, but uses a page instead of a post to prevent double posts on the front page. Going forward we’re going to recommend on product marketing sites like this a “start with sticky” policy because it provides a kind of launching pad for all of the other posts, which can sometimes get lost. Users can still find posts using categories or tags, but for the most important posts, they should be linked to from the sticky page and possibly even through the top navigation bar. Most of the time we will start off with allowing WordPress to automatically display pages, but as the site ages and becomes more concrete, we’ll go back and manually manipulate the page navigation to add posts and other keywords for SEO reasons. 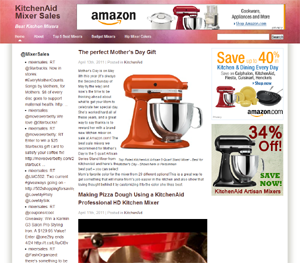 Overall we see good things for Mixer Sales and wish them well in their endeavor to help people find the best deals on kitchen stand mixers, which have become more and more popular over the last several years. Megamind (voiced by Will Ferrell) is a comedy movie for children ages 7 and older about an evil maniac who finally defeats his long-time nemesis Metro Man (voiced by Brad Pitt) and then merrily goes about laying ruin to Metro City, reveling in the fact that he can now have anything he wants. But then, Megamind’s glee quickly turns to dissatisfaction as he realizes that the battle was half the fun and everything now comes too easy. Enter the nerdy Hal (voiced by Jonah Hill) into Tighten, a new hero for Megamind to battle. What Megamind doesn’t count on is that Tighten may not turn out to be as good as he’s meant to be. Nor does he anticipate falling in love with his old rival’s girl Roxanne Ritchi (voiced by Tina Fey). In the end, Megamind finds he must rethink his assumptions about good, bad, and what makes him happy. Disney’s Tangled is a music-filled adventure full of romance and comedy for kids and children ages 6 and older. The movie focuses on Rapunzel, a girl with long magical hair who’s lived her entire life imprisoned in a tower by her mother. Naturally optimistic and acquiescent, Rapunzel (voiced by Mandy Moore) rarely complains about her circumstances, but for her 18th birthday she longs to leave the tower to see the floating lights that appear every year on her birthday. Her mother (voiced by Donna Murphy) refuses her request, but when thief Flynn Ryder (voiced by Zachary Levi) climbs the tower to escape his pursuers, Rapunzel eventually decides to trust the young man and convinces him to help her escape to see the floating lights. Tangled is a masterful blend of comedy, adventure, passion, and drama combined with a fantastic music and the type of animation we’ve come to expect from Disney. The 3D effects add to the experience but most likely won’t really be missed in other formats where they are missing. 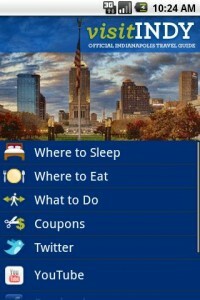 Did you know there are Android apps made just for the city of Indianapolis and it’s attractions? Search hotels, restaurants, attractions and events based on your location and interests You can also search using Augmented Reality for a street view of what’s close by. Plan your travels by adding preferred destinations to your favorites and generating customized maps. Redeem cost-saving coupons directly from your phone at top Indianapolis restaurants and attractions.